Located in the Cumberland area, The Battery Atlanta is a mixed-use development boasting unique shops and restaurants, as well as luxury living accommodations. 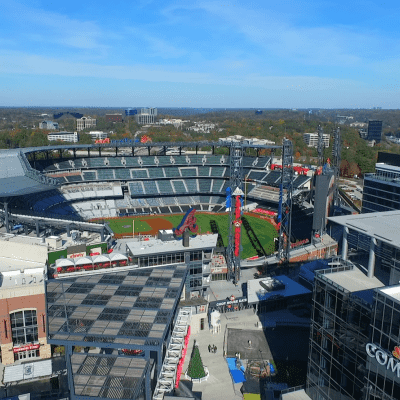 The Battery’s main attraction is SunTrust Park, the new homes to the Atlanta Braves, making it one of the South’s premier lifestyle and entertainment destinations. Early baseball writer, Henry Chadwick, first used the term “battery” to compare a baseball team’s pitching staff to an artillery. Later on, the term was used to describe the effectiveness of a pitcher and catcher. The Battery Atlanta’s name pays homage to baseball’s rich history in Atlanta. Home to the Atlanta Braves, SunTrust Park is one of a kind. The ballpark has the highest percentage of seats closer to the field than any other Major League Baseball park. The Park’s LED lights provide a better viewing experience for fans watching from the stands or even in the comfort of their home. With 41,000 seats specially designed to maximize visibility, every seat is the best in the house!